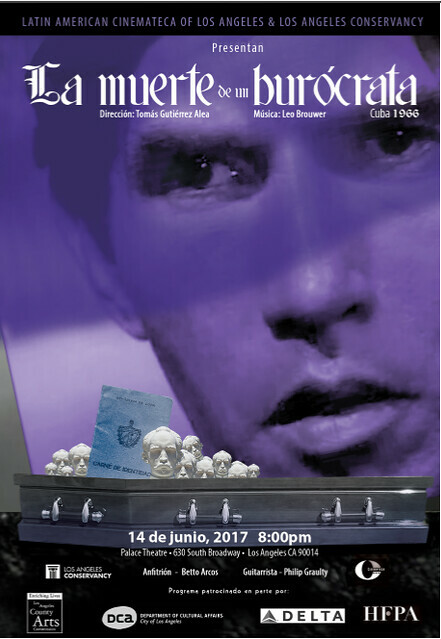 Tómas Gutiérrez Alea's classic dark comedy, Muerte de un burócrata, is set in the early days of Fidel Castro's Cuba, poking fun at red tape and communist bureaucracy. This year's program was hosted by independent radio producer and freelance music/arts journalist, Betto Arcos, and featured a special performance by guitarist, music educator, and cultural producer, Phillip Graulty, who performed pieces from the legendary Cuban composer, Leo Brouwer. We'd like to thank the Los Angeles Conservatory, our sponsors, and all our volunteers!